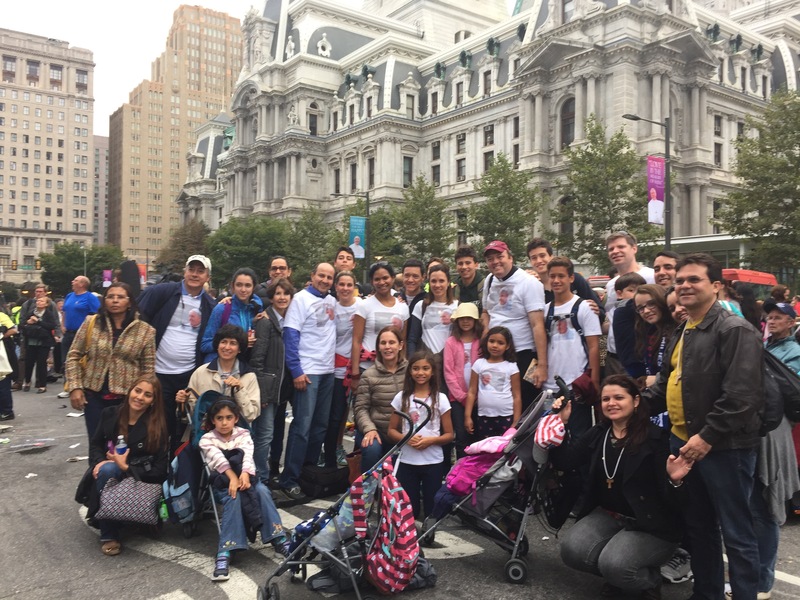 The World Meeting of Families with Pope Francis took place in Philadelphia from September 22-27. Many of our Congregations and Institutes participated in this extraordinary event. 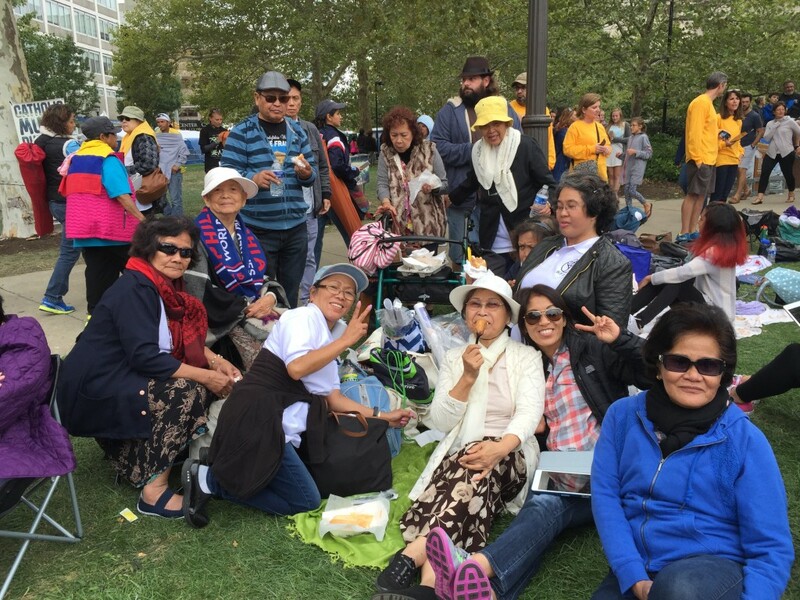 The World Meeting was actually divided into two parts, The Family Conference that lasted three days and took place at the Philadelphia Convention Center and the historical Papal Pilgrimage of Pope Francis culminating with almost two full days in Philadelphia. The Conference featured world renowned speakers, informative panels and two exhibit halls packed with over 250 exhibitors. It was an exciting event for the 20,000 conference participants. The Papal pilgrimage featured Pope Francis! What more do we need to say? 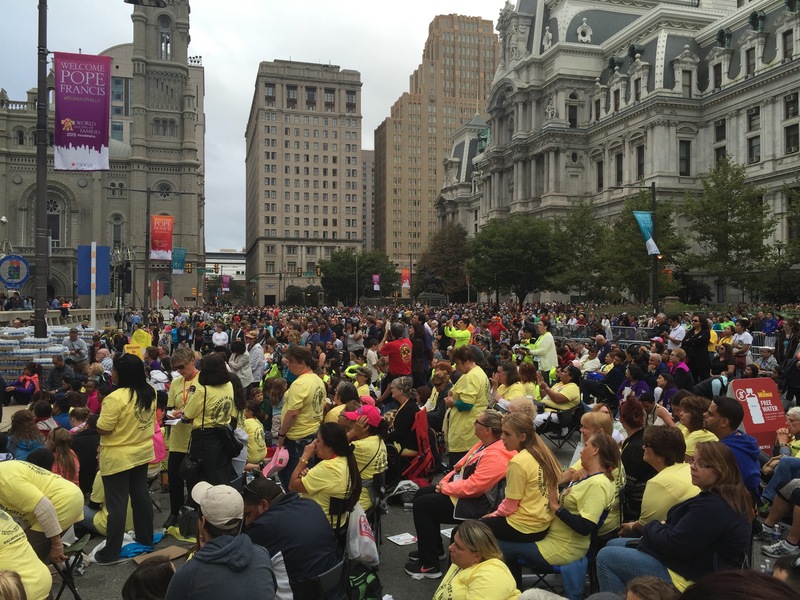 Over 1 million people participated in the various public and private events over his two day stay in Philadelphia. 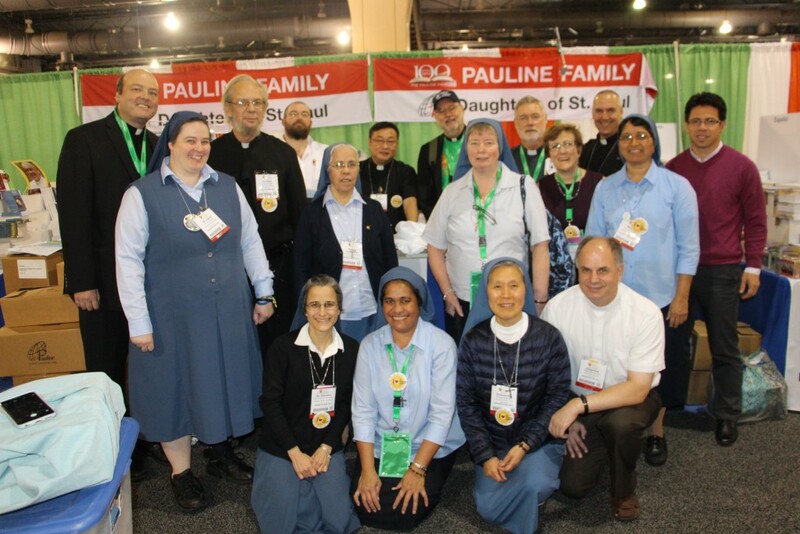 The Pauline Family enthusiastically participated in both stages of the World Meeting of Families. We had eight booths that lined almost an entire row in the exhibition hall. It might be said that the Pauline Family had more volume of space in the exhibition hall when compared to any other group. It was exciting to see the joint project of the various members of our Pauline Family. The Pauline Family also took to the road during the Papal pilgrimage. We were dispersed all over the place and brought great Pauline spirit to everyone we met. Fr. 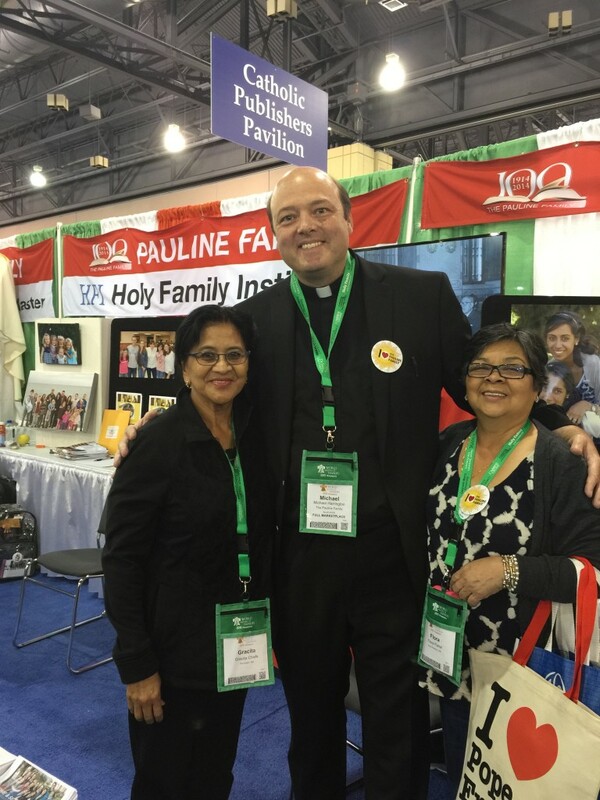 Tom Fogarty, Delegate to the Holy Family Institute in the United States, invited Rachel Quinto, a Perpetually Professed member of the Holy Family Institute to reflect on her experience at the World Meeting of Families. The article below is her reflection. Interspersed throughout the article, Fr. 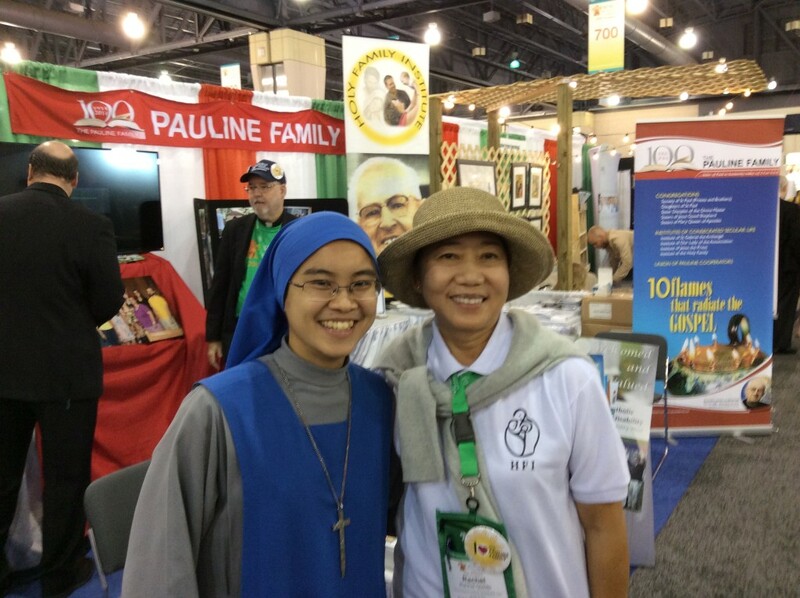 Michael Harrington has added pictures that were taken by various members of the Pauline Family showing some of our participation in the various events of the World Meeting. “Love is our mission.” This is the buzzword that started it all. 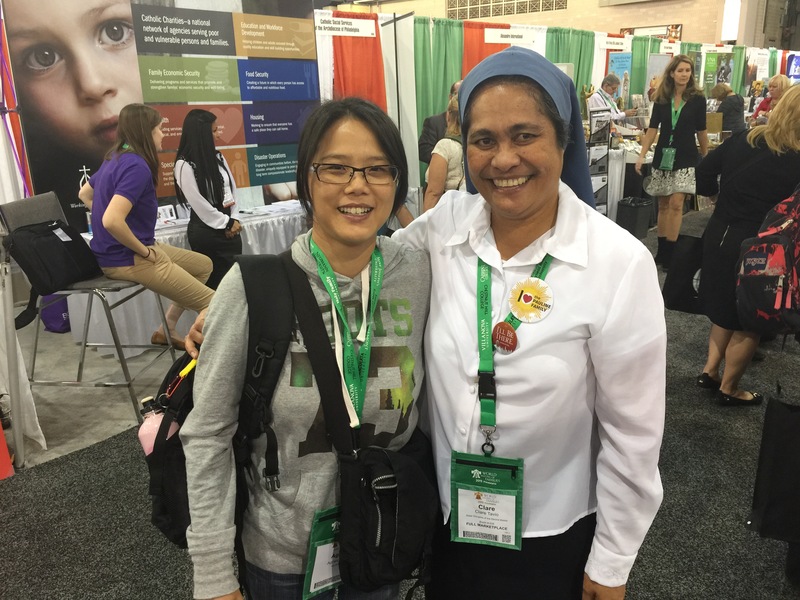 It is the stated purpose of the World Meeting Of Families 2015 and of Pope Francis’ first ever visit to the USA. For us, the buzz started during Triduum 2014 when we heard from Fr. Mike Harrington that this event will be held in Philadelphia. Wouldn’t this be an excellent opportunity for the Holy Family Institute to be part of and also be with the Holy Father? Indeed it would be and without second thoughts Fr. Tom gave the idea his blessing. Thus began the exciting saga of who, when, and how this HFI participation will be accomplished. 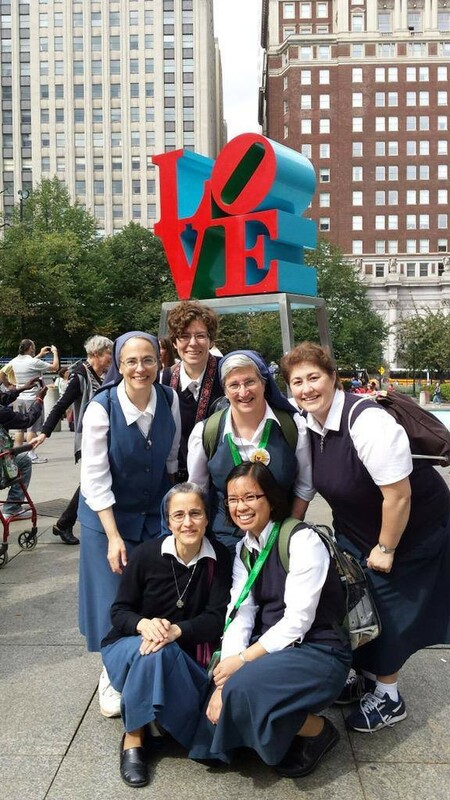 The trip to Philly was conceived as a pilgrimage: to ask for vocations to the Pauline Family and to the HFI, to plead for the needs of families besieged by our media-dominated culture and as testimony to our love and devotion to the Church personified by Christ’s Vicar on earth. Thus, our mission, from the early stages of planning to its eventual successful completion and everything in between, was a labor of love. There were 2 separate major events for this pilgrimage. 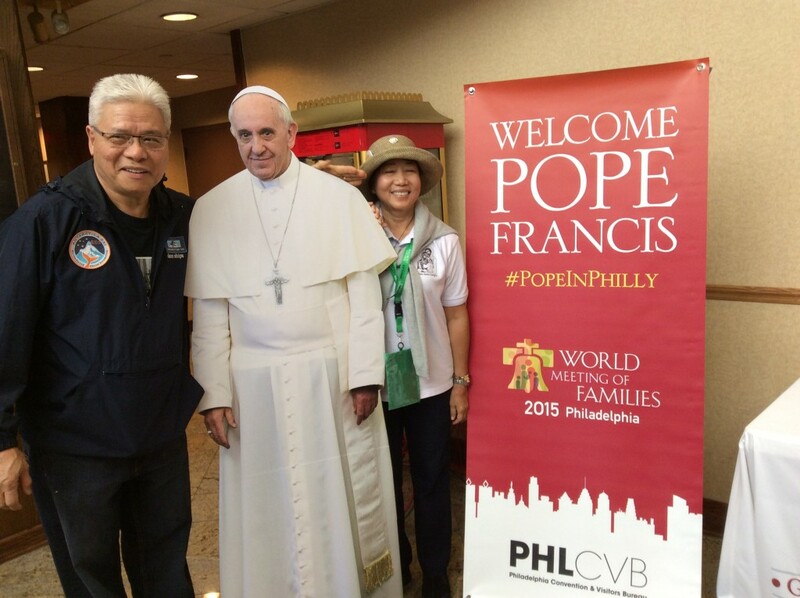 First to take place was the 5-day WMOF at the Philadelphia Convention Center. “The family fully alive” is a major theme of the congress. For this occasion where thousands of people from all over the world converge to celebrate God in family life, our Pauline religious congregations wisely decided to promote our version of family life in the international Pauline Family and the Holy Family Institute. Fr. 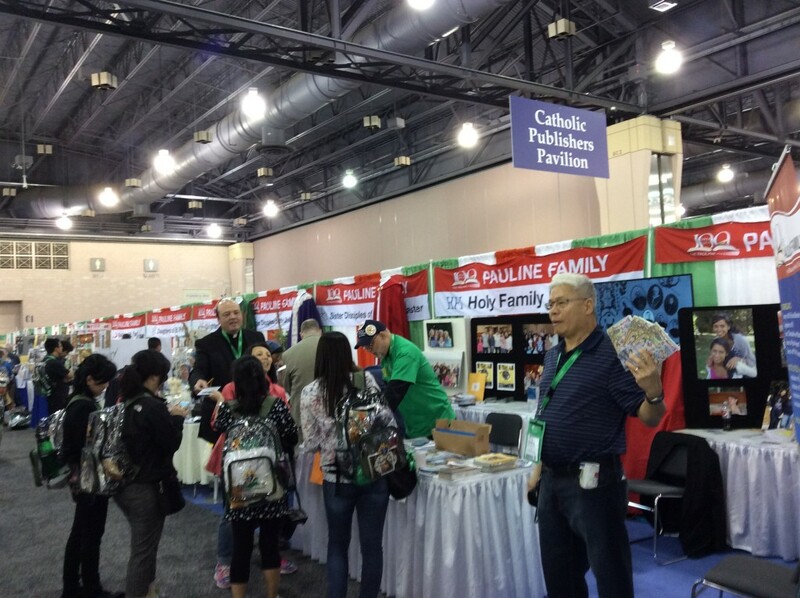 Michael Goonan laid the groundwork ensuring that Blessed James Alberione’s foundations in the USA is seen as one big family, not only spiritually but visibly, by arranging for all our booths in the Exhibit Hall to be together. 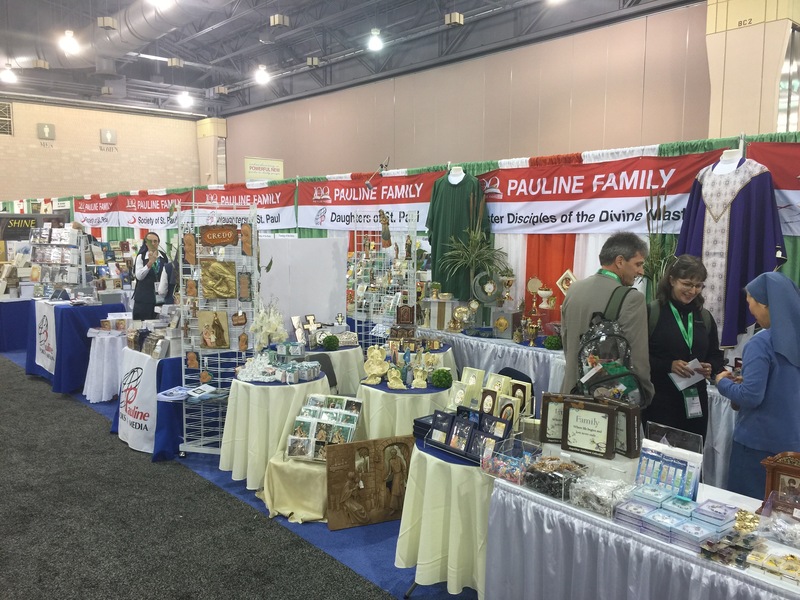 This set up effectively displayed the immediate bond among the Paulines, with our signage “PAULINE FAMILY’ emblazoned across 8 booths in a row! We happily re-discovered the prayers and thoughts of the Founder on behalf of the family. His inspiring words were printed by the FSP and the PDDM on holy cards with an original PDDM sculpture of Joseph, Mary and the child, Jesus. They made certain we had enough of these cards for distribution to those who visit the combined HFI and PF booths. 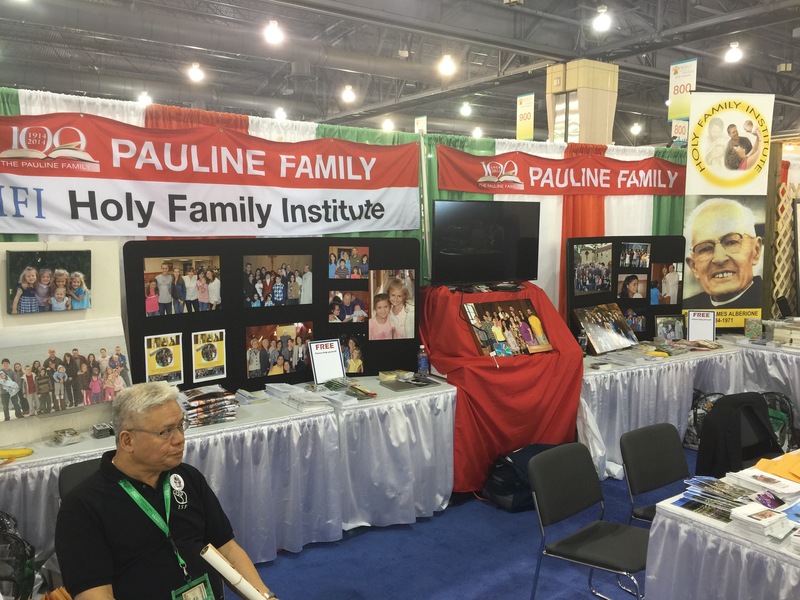 An attractive poster of The HOLY FAMILY INSTITUTE with a beaming photo of the Founder and another beautifully designed poster of THE PAULINE FAMILY dominated the booths. They not only attracted onlookers but also provided us with an excellent visual aid to explain what and who we are. Even the least articulate among us found his voice and enthusiastically shared the gift of the Pauline vocation with clarity and assuredness. We happily distributed free Pauline Family materials: books, booklets, bookmarks, prayer cards, buttons, magnets, etc. More importantly, we gave away manila envelopes stocked with HFI information for those who might respond to God’s call to live their married and family lives as consecrated laity. More than a dozen who received these envelopes left their names and contact information for a follow-up from us, should they decide to take the first steps towards membership in the HFI or have further inquiries about it. We had visitors galore from different parts of the country and of the world. There were many from Mexico and Latin America and, all of a sudden, we acquired the gift of tongues, pidgin Spanish to be exact. We talked excitedly, in impromptu sign language with our eyes and hands, to Pauline Cooperators from Brazil. We glowed with pride when Italian visitors stopped by to tell us they know of Giacomo Alberione and how they appreciate Famiglia Cristiana. We encountered Filipinos visiting from the old country and Filipinos newly transplanted to New Jersey and other parts of our adopted country. It was an exhilarating experience to be able to share our deepest joy to so many – God’s love and gift to us in our HFI vocation! Thanks to Fr. Matt and Sr. Nympha, PDDM, we did not have to spend all our time in the Marketplace (aka Exhibitors’ area). While they tended shop, we were able to attend the liturgical celebrations, the keynote speeches and some of the breakout sessions featured in those activity-packed yet Spirit-filled days. We even had time to visit the special exhibit “Verbum Domini II: God’s Word Goes Out to the Nations”. The exhibit featured 80 rare biblical texts, including Papyri from the third and fourth centuries and the Qumran scrolls. 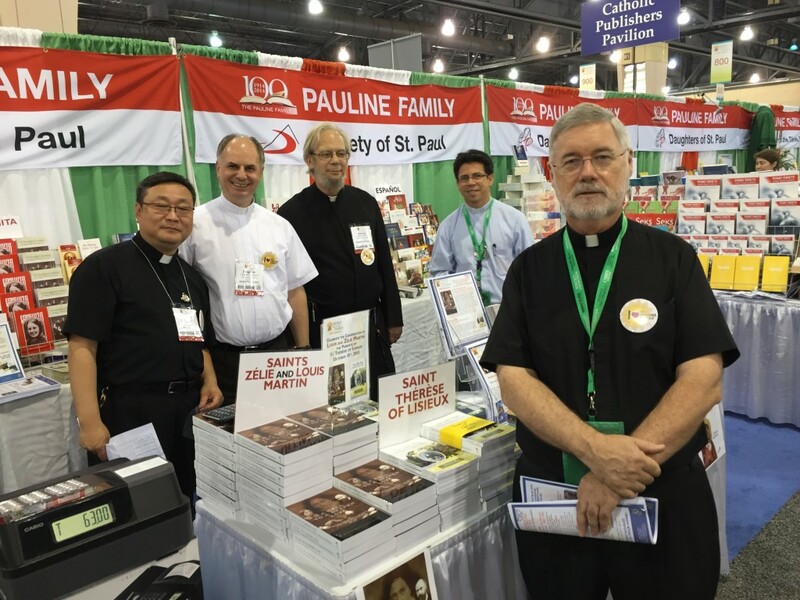 Though still full of zeal for the apostolate, the final day of the congress brought us welcome free time when it was announced that the Marketplace will close a day early. We packed our bags in central Philly and took the opportunity to visit an old friend in Bensalem who lovingly provided us with homemade goodies for the weekend of Papal events before heading north to Days Inn in Horsham, our home for pilgrimage part 2. After countless hours of emails and trips and negotiations, Kim Burke magnificently managed to obtain comfortable and reasonably priced accommodation in this hotel for the 150-plus group of Pauline Family members and friends who are attending the Festival of Families on Saturday and the Papal Mass on Sunday. But the travel arrangements from Days Inn Horsham to Ben Franklin Parkway, the venue for the Papal events, posed another hurdle. The security was so tight that organizers and city authorities warned the public about a large area of road closures. There was a tremendous demand for cheap but limited SEPTA Rail tickets such that a lottery was eventually set up for their sale. While half of our group took a chance for tickets through the lottery (which they all luckily received in the end) the other half opted early on to secure charter buses for the trip. 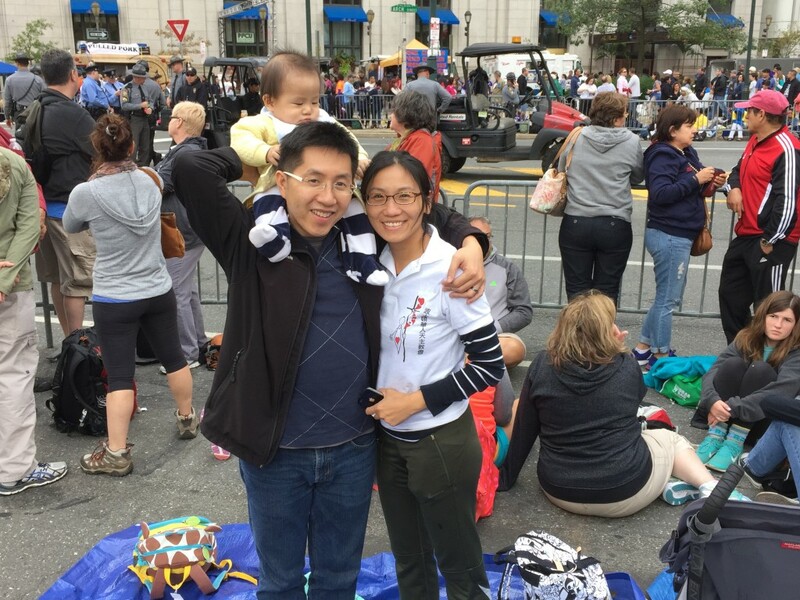 The price for this option was more than quadruple the cost of the public transportation but it provided a sure way for getting into the city and, of course, the chance to physically see Pope Francis and receive his apostolic blessing in person. Saturday began with shared meal and fellowship for spirit and body, first with a concelebrated Mass by the PF priests followed by brunch. The familial ambiance of the Pauline Family worshipping together and sharing a meal together was a powerful experience of our oneness and just as equally relaxing, following the hectic working days at the WMOF. We were at table with our SSP priests and Brother Zbigniew. 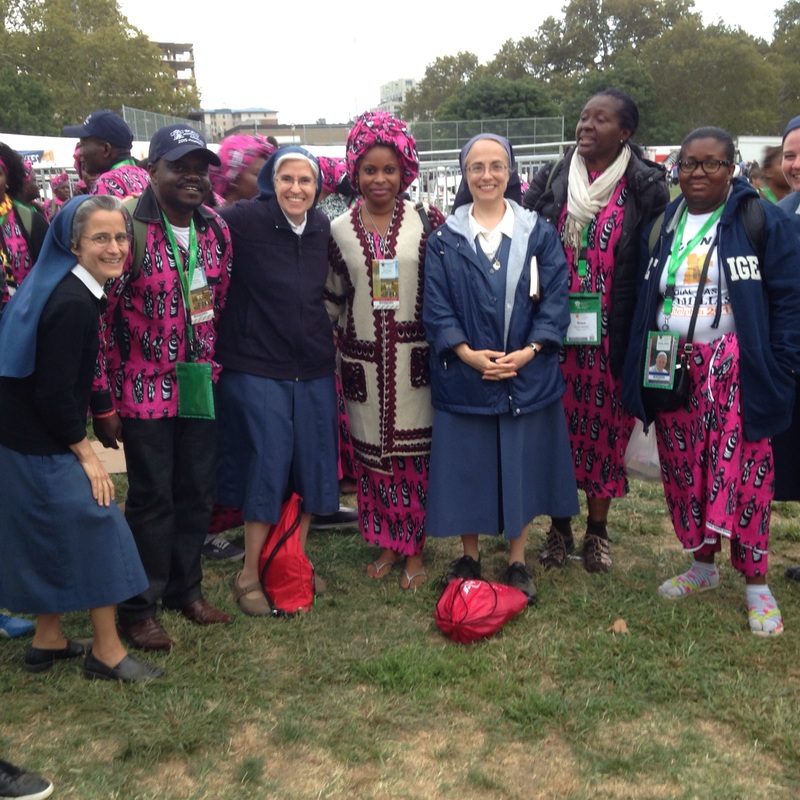 Our small group had such a pleasant time which extended to our being providentially thrown together as we pilgrimaged throughout the Papal events. On the drive to the city for the festivities with the Pope, the highway was almost deserted and our bus drivers kept exclaiming how strange it felt without the gridlock. There were police cars and check points at every intersection. It seemed we were the only ones on the road but, as soon as we arrived at the stadium parking area, we realized there were already thousands ahead of us. On both days the walk to the parkway and back to the bus was almost 6 miles; on both days we stood on our feet for over 12 hours; on both days we waited in line for at least 3 hours just to get through the airport style security check point. Was it worth it? Most definitely! 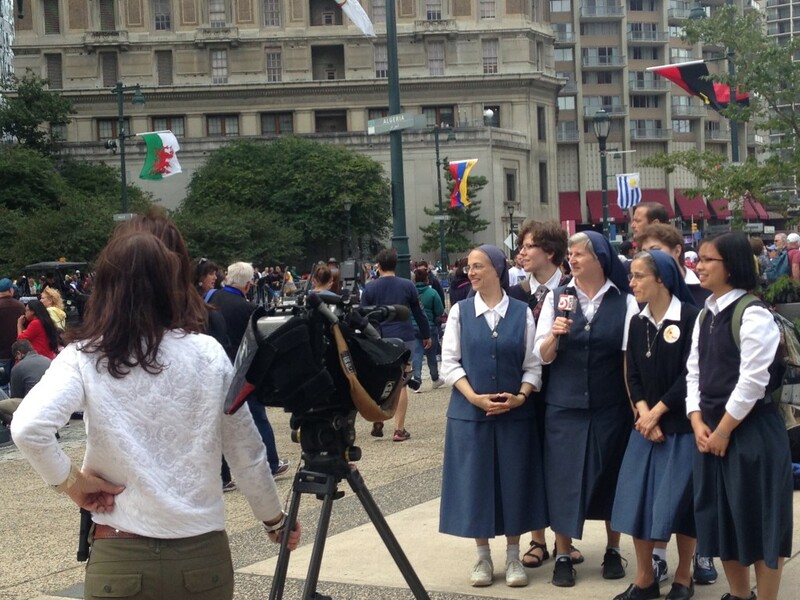 The atmosphere of contained jubilation that pervaded the week of the WMOF prevailed during the week-end. In fact, it had intensified and people were freely expressing their joy for just being there. We chatted with almost every person we were waiting in line with. Where are you from? Who are you traveling with? What is the name of your religious congregation, Sister? There was an attitude of hopeful anticipation which the hours of standing and waiting did not dissipate. We can feel the bond that linked each one of the thousands who were there for the Holy Father, validating our relatedness as part of God’s family, the human family, the Church. Some of us were fortunate enough to have special passes which entitled us to a “Reserved Standing Section” in the parkway. But there was space for everyone to have a reasonably good view of the Pope or for a photo or video of the Papal motorcade. Giant TV screens were all over for those who prefer to stay where they have comfortably found a patch of green to follow the events. The Papal Mass was as it should be, simple yet profound. The familiar gestures and words of the liturgy done and spoken by the Holy Father highlighted the love which, particularly in the person of the successor of St. Peter, united us in the celebration of the Eucharist. The presence of our SSP priests, Fr. Sebastian and Fr. Favio, among the concelebrating priests made us feel closer to the altar than our actual location. It was touching to witness the multitude in this cathedral of the open sky fully and actively participate in the Sunday solemnity in an orderly but not orchestrated fashion . There was a moment when time seemed to stop as Pope Francis gathered all our prayers into his hands and offered it straight to heaven in one solitary voice. After the Mass, the atmosphere of hushed reverence hung on the air for a little bit more, as if people wish to savor the experience some more in their hearts. Like everything in this life, all good things come to an end. For security reasons, none of the more than 800,000 estimated people present were allowed to leave until the Papal plane has taken off at the airport. When the appointed time came around, there was a deluge of humanity headed for the same direction, the vast majority for the subway stations. People simply followed groups in front of them and it was fairly easy for individuals in small groups to get separated and be engulfed by the larger groups. This happened to us and it was almost miraculous how we managed to find each other and be timely reunited. People were like schools of fish, in various sizes, shapes and colors, moving tightly but without jostling yet quite noisy. Joyously noisy. There was no grumpy face or scowl to be seen considering that we had been on our feet for many hours and had been up since early morning. Pope Francis’ smile had infected everyone. Even as the crowds moved along in spurts, groups especially of young people were singing and playing musical instruments. To borrow from Romans 8:38-39, the people were saying: neither sweat, nor fatigue, nor every possible body ache – can ever separate us from the experience of God’s love! Recognizing that the soul of every apostolate is prayer, we undertook the prayer crusade, “40 in 40”- forty hours of Eucharistic Adoration in forty days, for our pilgrimage intentions. With the prayerful support of Sr. Margaret, PDDM, an HFI member in Fresno committed to an hour of Eucharistic adoration each day beginning 40 days before the final Papal Mass in the USA in Philadelphia. 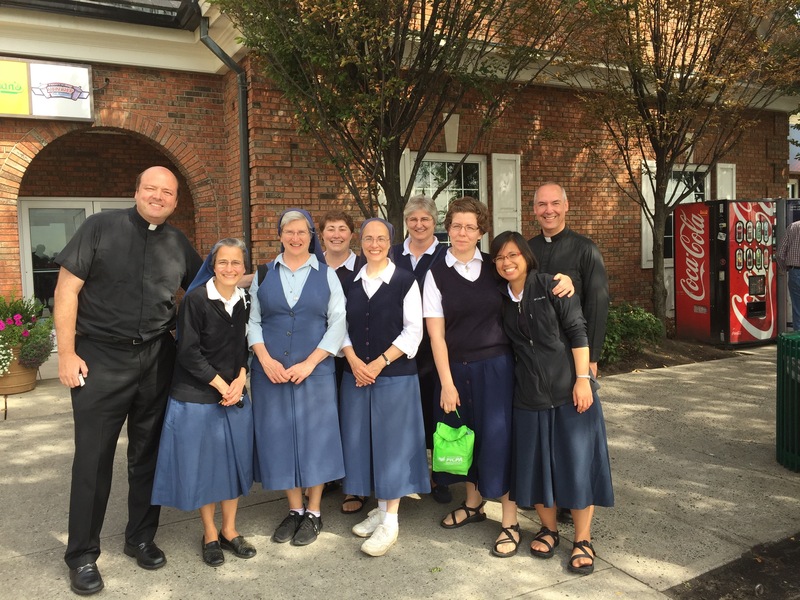 Not long after, in Las Vegas, we saw 6 admitted to novitiate and a dozen postulants. 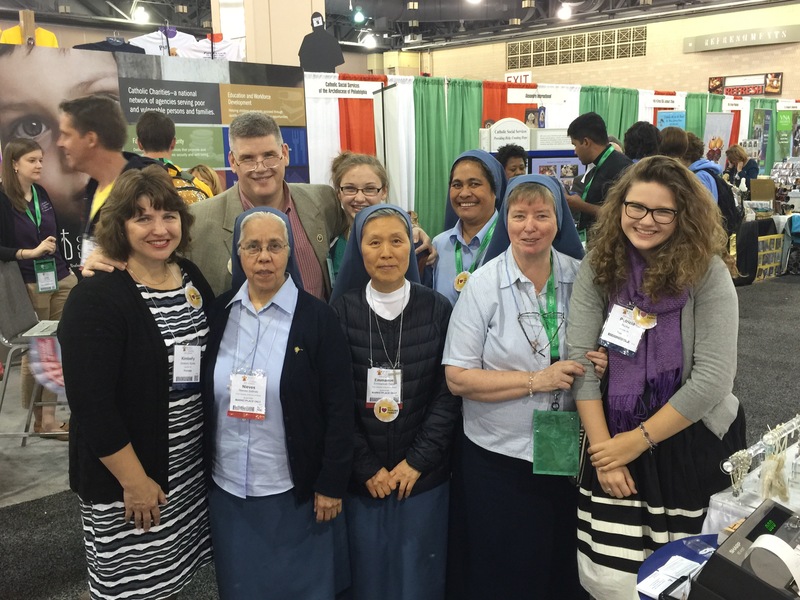 One postulant in particular caught my attention because she was wearing the “I Love the Pauline Family” button. 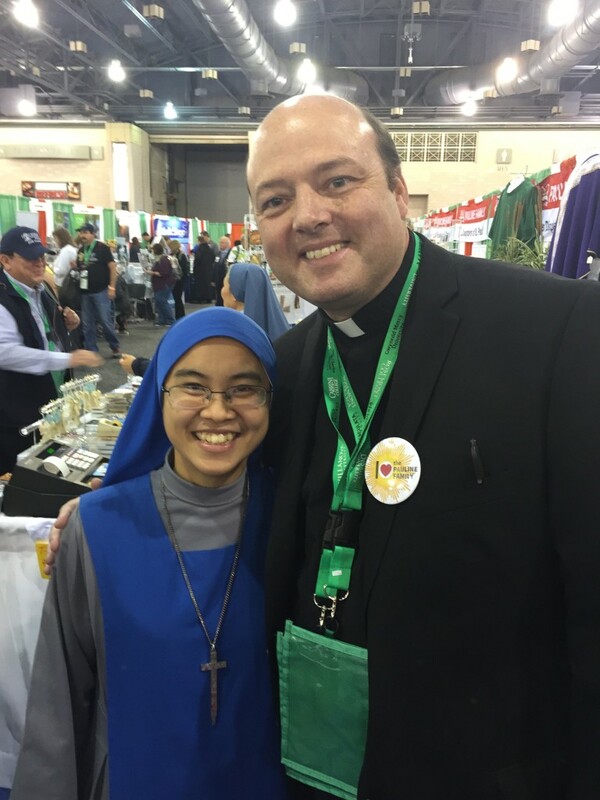 She proudly said she, too, was in Philly and had visited our booth at the WMOF. I can hardly believe how quickly our prayers were answered. Here before me was the proof. I hugged her tightly, grateful to the Eternal Shepherd for sending good laborers so soon into his harvest! And in Fresno, since then, we have 2 couples begin postulancy.